As I sit down to write this communication, the Finance Minister has just concluded presenting the Interim Budget. In an invigorating Interim Budget speech, for the first time by a Chartered Accountant, the Finance Minister left no stone unturned in highlighting the series of measures taken by the Government to overcome policy paralysis and bring the Indian economy back on track. While a bystander may get a perception that some of these recollections amount to blowing one’s own trumpet, perhaps in these times of persistent negativity and noise, some element of positive assertion helps build confidence. Departing from established conventions, the Finance Minister also proposed certain amendments in the tax laws. Interestingly, there was a departure not only from convention but also from a traditional mindset. Essentially, the proposals do not aim to merely provide incremental benefits but appear to suggest a recalibration of tax laws and limits to accept ground level realities and changing times. The doubling of the basic exemption limit for individuals from Rs. 2.5 lakh to Rs. 5 lakh and the quadruplicating of the threshold limit for TDS on interest on bank fixed deposits from Rs. 10,000 to Rs. 40,000 cannot be simply brushed aside as incremental changes. Nor can one ignore the concession granted for the second residential house, both in terms of interest deduction and the reinvestment benefit. GST has been a classic example of how multiple Government agencies having distinct taxing powers can collectively administer and recover taxes from the common subject. Perhaps taking inspiration from the said success, the Interim Budget also proposes reforms in the levy and collection of stamp duty on financial securities transactions. Collecting such stamp duty at one place through the Stock Exchange and sharing the same backend with the State Governments seamlessly on the basis of domicile of the buying client, could bring in much needed simplicity in the administration of the said duty. One more reflection of the mindset change could perhaps be an elaborate thanksgiving to the tax payers. Through some examples drawing an emotional connect with the tax payers, the Finance Minister acknowledged the stellar role of the tax payers in contributions towards nation- building. While it is always said that taxes are the price that the society pays for building civilization, it is not very common for a Finance Minister to acknowledge such contribution wholeheartedly through the Budget speech. This mindset change is now clearly visible in many of the interactions with the Government officials. The CPC - TDS is on a mission to roll out the next phase of reforms in the field of filing of TDS Returns. In an inspiring talk at the BCAS, the Commissioner Mr. Sunil Sharma with full humility outlined the proposed system and wholeheartedly invited suggestions and constructive feedback for improvements. The Society had the privilege to have an interactive discussion with the IIA Global Chairman Mr. Naohiro Mouri and IIA Global President Mr. Richard Chambers on the side-lines of the International Conference on Internal Audit. It was interesting to hear about their life journeys and we could carry home many lessons for the growth of the internal audit profession. The discussion will be transcribed and carried in the next issue of the Journal. A host of amendments proposed in the GST Act were ultimately made effective from 1st February 2019. Many of these amendments are carried out retrospectively and clearly represent a mindset of the Government to understand the ground level difficulties and provide workable solutions to such difficulties. Notable amongst them is the permanent burial of the reverse charge mechanism in case of supplies received from unregistered persons. It is perhaps now time for the industry and the professionals to welcome this mindset change with positivity and build up confidence and assurance in the long-term reforms and growth. While constructive criticism is an essential ingredient of any live and vibrant democracy, too much of criticism without a logical basis for the same could result in the economy reverting back to policy paralysis. The next edition of the Journal will mark the conclusion of the 50th year of the Journal. 50 years is a very important milestone. In the context of a magazine published by a voluntary organisation, it speaks volumes about the contents and the relevance. 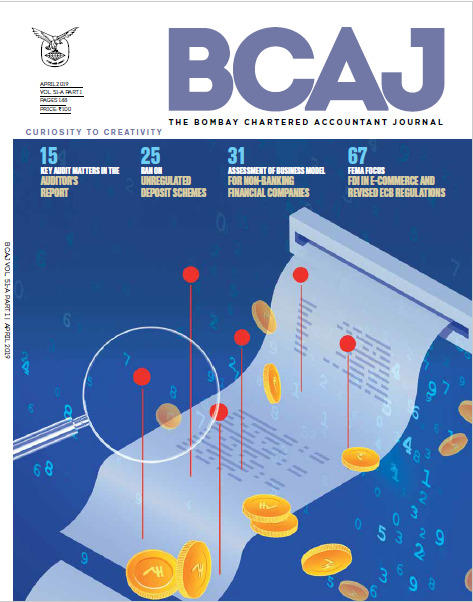 The next edition of the BCAJ will do its bit to spread this positivity especially in the context of the accounting profession and would be a must read for all the professionals. The Editorial Team led by Raman Jokhakar has ably curated the best of articles and features and I eagerly await the said edition. In the meantime, I wish you all a very happy reading.